I have been so sick for the past month that my body would not even tolerate Chicken Soup, nearly an entire month eating nothing but plain vegetables. However, my two sons still have wanted to eat regular food. I made them this Burnt Ends recipe for an episode of Cook’s Country a few weekends ago. While the recipe takes 8 hours, it required very little effort and gave them a few day’s worth of meals. The sauce is light; no molasses or anything special (like root beer or coffee); which allowed the smoked beef flavor to come through. Using boneless beef means the meal is more straight-forward to eat using a knife and fork, but the bone would have added flavor and texture during the slow cooking time. Also the uniform thickness of the brisket was more like eating cubes of beef instead of burnt ends. Both my sons loved the recipe and they gave it 4 stars. I tasted the beef, but my compromised taste buds did not like it at all. Instead I ate boiled potatoes and broccoli for 3 weeks, which made my girlfriend happy because I lost more than 10 pounds. Chris Kimball says to for a brisket with a significant fat cap; but supermarkets always package brisket with fat cap down. If your schedule doesn’t allow for 8 consecutive hours, you can brined the beef ahead-of-time, and refrigerated for up to a day in a Zip-log bag. If you don’t have 1/2 cup of juices from the rested brisket, you can make up for the deficit using beef broth. If you are using a gas grill you will need 2 disposable aluminum pans. Also you should add 1/2-cup of ice cubes to 1 wood chip packet. When you prepare your gas grill you should remove the cooking grate and put both wood chip packets directly on primary burner; and both disposable pans each filled with 2 cups water directly on secondary burner. Replace the cooking grate, turn all burners on high, cover, and pre-heat grill until for 15 minutes until hot and wood chips are smoking. Leave the primary burner set to high and turn off other burners. During cooking, adjust the primary burner as necessary to maintain grill temperature between 275 to 300 degrees. Start time 10:00 AM. Ready at 6:00 PM. Add 2 quarts of cold water to a large container, stir in 1 cup kosher salt (5 ounces) and 1/4 cup granulated sugar until dissolved. Slice brisket with the grain into long 1-1/2 inch wide strips. Add to brine, cover the container, and refrigerate for 2 hours. Remove from brine and refrigerate for 2 hours, and use paper towels to pat the beef dry. Combine 1/4 cup packed brown sugar, 2 tablespoons pepper and remaining 1 tablespoon kosher salt in a small bowl. Season beef all over with rub. Just prior to grilling, soak 2 cups of wood chips in tap water for 15 minutes. Drain and divide equally into the center of 2 large pieces of heavy-duty aluminum foil. Wrap wood chips up in 2 foil packets. Cut 3 to 4 vent holes in the tops. Open the bottom vent of your charcoal grill halfway (see comment #4 if using gas grill). Put disposable pan filled with 2 quarts water on 1 side of grill, with the long side of pan facing center of grill. Lay 3 quarts of unlit charcoal briquettes on opposite side of grill and put 1 of the wood packet on top of the until coals. Ignite a large chimney starter filled halfway with 3 quarts of charcoal. After 15 minutes when the top-most coals become partially covered with white ash, evenly pour the lit coals on top of unlit coals. Top with the second wood packet ontop of the lit coals. Replace the cooking grate, cover, and open the lid vents halfway. Pre-heat grill for 5 minutes until hot and wood chips are smoking, about 5 minutes. Clean and oil cooking grate. 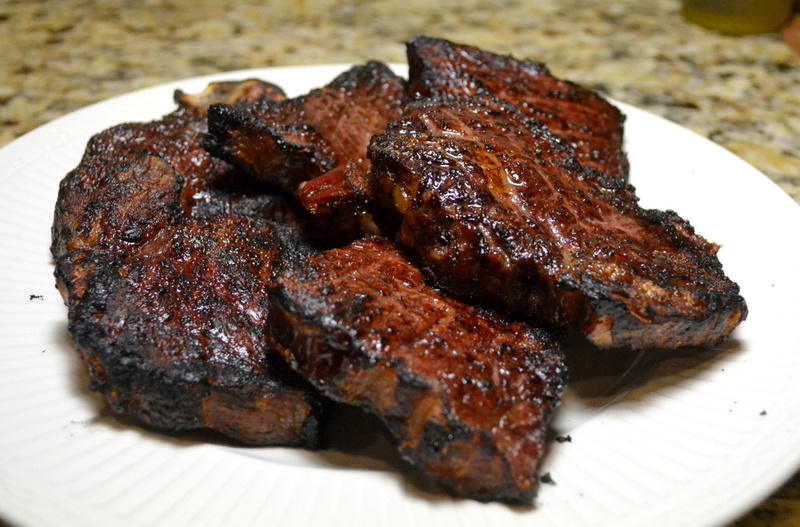 Lay brisket slices on cool-side of grill as far away from the coals as possible. Cover the grill positioning the lid vent directly over brisket to draw the smoke over the meat. Cook without opening for 3 hours. Set and oven rack to the middle of your oven and pre-heat to 275-degrees. Remove brisket from grill and set in a rimmed baking sheet, lined with aluminum foil. Tightly cover with more aluminum foil. Roast for about 2 more hours until a fork slips easily in and out of meat. The meat should register about 210 degrees using an instant-read thermometer. Remove from oven, and allow to stand for 1 hour (while still covered with foil). Remove foil, transfer brisket to carving board, and pour accumulated juices into fat separator. Prepare the barbecue sauce by combining the ketchup, sugar, vinegar, Worcestershire, granulated garlic, cayenne, and 1/2 cup defatted brisket juices into a medium saucepan. Put over a medium burner, bring up to simmer and cook for 5 minutes until slightly thickened. Cut brisket slices crosswise into 1-to-2 inch chunks. Add brisket to barbecue sauce and toss to combine. Serve in a large bowl. This year, I was looking to make my first corned beef brisket to share with my two sons on St. Patrick’s day. 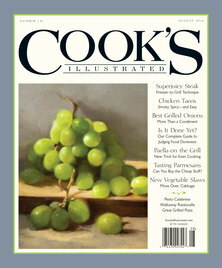 The recipe was just published in the latest issue of Cook’s Illustrated (March/April 2016), including a 6-day brine. Unfortunately, I did not buy the special pink curing salt (sodium nitrite) in time; it needs to be purchased online. So instead, I bought one of those ubiquitous pre-packaged briskets that appear in my supermarket around St. Patrick’s day. The beef is suspiciously inexpensive; I am not sure how more than two pounds of brisket can cost a total of only $7. By starting with a pre-packaged, pre-brined brisket, I am not sure how accurate my 4-star rating can be. Of course, home-brined briskets will be far superior that my pre-packaged brisket. Never-the-less, I was happy with the overall technique used in the recipe and will try to order the curing salt well ahead of next year’s St. Patrick’s Day feast. 4-stars, but the jury is still out on the final rating of this recipe. If you do not use pink curing salt #1, your brisket will be grey instead of pink. While not called for in Chris Kimball’s original recipe, I caramelized some of the fat cap before cooking. It added great flavor and improved the overall texture of the fat cap. Started: 4:00 pm Ready: 7:30 pm. Trim fat on surface of brisket to 1/8 inch. Dissolve salt, brown sugar, and curing salt in 4 quarts water in large container. Add brisket, 3 garlic cloves, 4 bay leaves, 5 allspice berries, 1 tablespoon peppercorns, and 1 tablespoon coriander seeds. Weigh brisket down with plate, cover, and refrigerate for 6 days. Set a rack to the middle of your oven and pre-heat to 275-degrees. Remove the brisket from brine and rinse under cold tap water to remove any excess salt. Use paper towels to pat dry. Brown fat-side of brisket in Dutch oven over high burner for 5 minutes until nicely caramelized. Prepare a spice bundle by cutting an 8″ square of cheesecloth. Peel 3 garlic cloves. Put garlic, 2 bay leaves and 1 tablespoon peppercorns in the center of the cheesecloth, and use kitchen twice to tie into a bundle. Add brisket, 2 quarts of water and spice bundle to a Dutch oven; it’s okay if the brisket does not lie completely flat. Cover pot and put over a high burner until it comes up to a simmer. Move to oven and bake for 2-1/2 to 3 hours, until you can easily insert a fork into the thickest part of the brisket. Remove Dutch oven from oven and turn off oven. Set brisket in a large oven-safe platter, and pour 1 cup of the cooking liquid over meat. Cover with aluminum foil and keep warm in the turned-off oven. Peel your carrots and cut them in half cross-wise; then slice the thick-ends in half lengthwise into long, equally thick slices. Do not peel your potatoes. Set the Dutch oven over high burner and add your carrots and potatoes. Bring up to a simmer over high burner. Reduce burner to medium-low, cover, and allow to simmer for 7 to 10 minutes until the vegetables begin to soften. Cut your cabbage through the core into 8 wedges. Add wedges to pot, and increase burner to high until the pot comes up to a simmer. Reduce burner to low and cook for 12 to 15 minutes, covered, until all the vegetables become tender. Meanwhile, set the beef on a cutting board and slice against the grain into 1/4″-thick slices, returning the slices to the platter. Use a slotted spoon to add the vegetables to the platter. Add additional broth to platter and serve. Today’s recipe is similar to this 9-year-old recipe. That recipe caused me some confusion while grocery shopping and I inadvertently bought only the green pepper (not buying the red pepper as well). I bought the snow peas called for in the old recipe; but then forgot about them and did not include them in today’s recipe (not called for but would have made up for the lack of red pepper). Prep your ingredients in advance; be prepared for quick cooking time. Our domestic stove-tops are shaped for a non-stick skillet, not for a wok. Limit stirring during cooking so that food can develop color. Sear meat in batches so that it doesn’t steam. Add aromatics last to preserve flavor and avoid scorching. Start time 5:00 PM. Dinner time 5:45 PM. Trim flank steak and slice into 2-1/2″ strips going with grain; then cut each strip crosswise (against the grain) into 1/4″-thick slices. In a medium bowl, mix together 1 tablespoon water and 1/4 teaspoon baking soda. Add sliced beef and toss until coated. Allow to stand at room temperature for 5 minutes. In a small bowl, whisk together 1 tablespoon soy sauce, 1 tablespoon sherry, 1-1/2 teaspoons cornstarch, and 1/2 teaspoon brown sugar. Add soy sauce mixture to beef, tossing to coat, and allow to stand at room temperature for 20 to 30 minutes. Meanwhile, begin to cook the steamed white rice (see basic recipe below). The vegetables (bell peppers, scallions, garlic and ginger) and aromatics should all be prepared while the beef is marinating. Remove the stems and seeds from the peppers and slice into 1/4″-wide strips. Cut the scallions as follows: slice the white parts thinly on the bias, then cut the green parts into 2″-pieces. In second small bowl, whisk 1/4 cup water, 2 tablespoons soy sauce, 2 tablespoons sherry, 1-1/2 teaspoons cornstarch, 2 teaspoons brown sugar, 1 tablespoon oyster sauce, 2 teaspoons vinegar, 1-1/2 teaspoons sesame oil, and 2 teaspoons ground black pepper. Whisk until combined. Set 12″ non-stick skillet over high burner and pre-heat 2 teaspoons vegetable oil until it just begins to smoke. Add half of beef in single layer, and cook without stirring for 1 minute. Flip and continue to cook for 1 more minute until spotty brown on both sides. Empty cooked beef into a third clean bowl. Repeat this step with remaining beef and 2 teaspoons vegetable oil. Return skillet to high burner, and add 2 teaspoons vegetable oil. Pre-heat until the oil just beginning to smoke. Add bell peppers and scallion greens. Cook for 4 minutes until vegetables are spotty brown and crisp-tender, stirring occasionally. Empty cooked vegetables to the bowl with the beef. Reduce burner to medium-high heat and return skillet to burner. Add 4 teaspoons vegetable oil, scallion whites, garlic, and ginger. Cook for 2 minutes; stirring frequently; until becomes lightly browned. Return beef and vegetables to skillet and stir to combine. Whisk sauce to recombine the ingredients. Add sauce to skillet and cook and stir for 30 seconds until sauce has thickened. Serve immediately over a bed of rice. Put rice in colander and rinse using cold running water until the water becomes clear. Set colander over bowl and set aside. Put medium saucepan over medium burner and pre-heat butter or oil. Add rice and cook for 2 to 3 minutes until rice becomes chalky and opaque; stirring constantly. Add water and salt to pot. Increase burner to high until comes up to a boil; swirl pot to blend ingredients. Cover pot. Reduce burner to low and allow to simmer without stirring for 18 to 20 minutes until all the liquid has been absorbed. Remove from heat, and place a clean kitchen towel; folded in half; over saucepan; replacing the lid. Allow to sit for 10 to 15 minutes. Use a fork to fluff the rice before serving. Makes about 4-1/2 cups of rice. I made Chris Kimball’s Best Ground Beef Chili two months ago. While I loved the flavor, I was disappointed in its utter lack of heat. Today, I added a four types of peppers to help amp up the spiciness. While still too mild for my taste (my two sons cannot handle too much heat), I was nevertheless much happier with the overall results. Grinding our own chiles makes a huge difference in this recipe; elevating the recipe into a special meal. The ingredient list is very long; you will definitely need to make a special trip to the grocery store. Sometimes my supermarket runs out of Ancho (and Guajillo chiles), so I recommend buying them in advance. 4-1/2 stars; still needs more heat. Also it is worth noting that the Ancho chiles in the recipe are used to make home-ground chili powder. When I first made this recipe two months ago, there was a discussion about why this recipe does not re-hydrate the chiles; the answer being that we are making chili powder; not chili paste. In the past I have been unable to find Ancho chiles, which are dried poblanos and are very, very mild. I have substituted Guajillo chiles, which are a little hotter, and can also be hard to find. In either case, I would recommend not exceeding 1 ounce, as Chris Kimball’s original recipe was a little too earthy. I’ve reduced the Anchos in today’s recipe from 6 down to 4. Cost: $12. (not including garnishes). 2 pounds 85% ground chuck. 1 Tablespoon crushed red pepper. 2 Jalapeno chilies, chopped fine. For best results, soak 1/2-pound of dried kidney beans and 1/2-pound of dried pinto beans overnight. Use 1-1/2 tablespoons salt for a 1/2-gallon of water. Add tortilla chips, cumin, paprika, garlic powder, coriander, oregano, thyme, 1/2 teaspoon cayenne pepper, 1 Tablespoon crushed red pepper, and 2 teaspoons pepper to bowl food processor. Process for 2 minutes until it becomes finely ground. Empty spices into a small bowl. Process the tomatoes with their juice in the food processor for 30 seconds until smooth. Add 1 tablespoon vegetable oil to the empty Dutch oven, set over medium-high burner. Add diced onion and 2 teaspoons salt; at cook for 6 to 10 minutes until have given off their water; stir occasionally. Press garlic directly into pot and cook for just 1 minutes. Add beef mixture from Step 1. Cook beef for 12 to 14 minutes; breaking up meat into 1/4″-pieces as it cooks. The beef should begin to brown and a fond should begin to form on the bottom of the Dutch oven. Add spice mixture from Step 3 and continue to cook and stir for 1 to 2 minutes; to bloom the spices. Add 1-1/2 cups water (or chicken broth), 2 teaspoons sugar, tomato puree, and pinto beans and their liquid. Bring up to a boil, and scrape the bottom of the pot to loosen any browned bits. Cover with lid, move to pre-heated oven. Cook for 1-1/2 to 2 hours until the meat is tender and chili has slightly thickened. Stir occasionally to prevent the chili from sticking. After 10 minutes stir to re-incorporate any fat that has risen to the top and add 2 tablespoons cider vinegar. Adjust seasoning with salt to taste. Serve, passing separately the lime wedges, cilantro, chopped onion and other garnishes; sour cream, cheddar cheese, guacamole or diced avocado, julienne-fried flour tortilla, or sliced scallions.